This photograph of two men sitting on a boulder near Cedar Falls in the Hocking Hills measures 8" x 10" (20.32 x 25.4 cm). Early settlers named the site Cedar Falls, mistaking the hemlock trees that surround the falls for cedars. 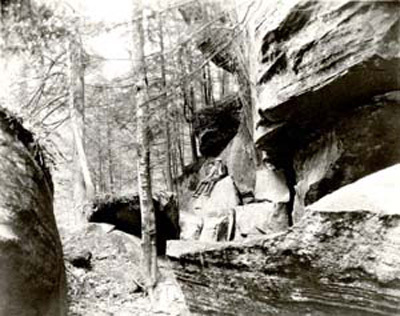 In 1924, the state of Ohio purchased 146 acres in the Hocking Hills that became Hocking Hills State Park in 1949. In 1972, the park added a dining lodge and cabins. Hocking Hills State Park is known for its geologic features of blackhand sandstone, including Old Man's Cave, Cedar Falls, and Rock House.